The photo at right is excerpted from a 1907 postcard of Knoxville showing the old covered bridge across the Cowanesque River. “HISTORY OF SEVEN COUNTIES presented by the Elmira Weekly Gazette". It is an “Outline History of Tioga and Bradford Counties in Pennsylvania, Chemung, Steuben, Tioga, Tompkins and Schuyler in New York by TOWNSHIPS, VILLAGES, BORO’S AND CITIES.” Written expressly for the Gazette Company, Elmira, N. Y. Copyright 1885. By an act of the Legislature of the State of Pennsylvania, approved March 26th, 1804, Tioga County was formed. It contains an area of seven hundred and nineteen thousand, three hundred and sixty (719,360) acres, or one thousand one hundred and twenty-four (1,124) square miles. It is bounded on the north by the state line between New York and Pennsylvania and the counties of Steuben and Chemung in New York; on the east by the county of Bradford; on the south by the county of Lycoming and on the west by the county of Potter. Its population is about 50,000. The capital or shire town is Wellsboro, situated on Charleston Creek, near the geographical center of the county, a rich and flourishing borough, containing about three thousand inhabitants. STREAMS--The principal streams in Tioga County are Pine Creek, Canoe Camp Creek, Crooked Creek, Corry Creek, Marsh Creek, Babbs Creek, Long Run, Mill Creek, Lamb’s Creek, Cedar Run, Troops Creek, Elkhorn, Fall Brook and the Tioga and Cowanesque Rivers. Pine Creek, one of the largest streams in the county, rises in Potter County and flows east and southward and empties into the West Branch of the Susquehanna River, near Jersey Shore, Lycoming County. The Tioga River rises in the highlands of Ward township, Tioga County and Armenia in Bradford County and at first flows southward, thence westward and thence northward, and uniting with the Cowanesque at the state line near Lawrenceville, Pa. The Cowanesque rises in Potter County and flows eastward through the valley of the Cowanesque, keeping near the northern boundary of the county and unites with the Tioga near Lawrenceville. Marsh Creek, Babbs Creek, Cedar Run and Long Run are tributaries of Pine Creek. Canoe Camp Creek, Cory Creek, Fall Brook, Lamb’s Creek, Mill Creek, Elkhorn and Crooked Creeks are tributaries of the Tioga River. Troops Creek and Mill Creek are tributaries of the Cowanesque. There are many lesser creeks and rivulets running at every conceivable angle, which added to the numerous springs make Tioga County one of the best watered counties in Northern Pennsylvania. SOIL--The soil of the county is well adapted to the growing of wheat, corn, oats, barley, the orchard fruits and garden vegetables, together with some very fine alluvial soils, well suited to the cultivation of tobacco, which is raised in the valley of the Tioga as far south as Covington, and in the Cowanesque valley as far west as Westfield and the county line near Harrison Valley and upon the waters of Pine Creek in the townships of Gaines, Shippen and Morris--and upon the waters of Marsh, Charleston and Crooked Creeks large profitable crops of tobacco are grown. Other portions of the county of which we shall speak more particularly in the history of townships, are well adapted to the pasturing of sheep, the raising of cattle and horses and the making of the golden rolls of butter and the manufacturing of cheese. MINERALS--Semi-bituminous coal is found in large quantities in Tioga County and mines are in operation at Blossburg, Morris Run, Fall Brook, Arnot, Antrim, Gurnee and Mitchell’s. There are annually mined in the county about thirty million bushels, or over one million tons of coal which is marketed, by the Fall Brook Coal Company, the Morris Run Coal Mining Company, the Blossburg Coal Company, the Gaines Coal and Coke Company, the Coal Run Company, Jacob Jones, Alexander Hutchinson and Joseph Mitchell. The four latter named being miners for home consumption. The Blossburg Coal Company at Arnot and the Fall Brook Coal Company at Tioga are largely engaged in the manufacture of coke from semi-bituminous coal. Iron ore is found in paying quantities at Blossburg and in the township of Richmond near the borough of Mansfield. Fire brick clay and glass sand rock is found in large quantities in the southern portion of the county in the coal region. TIMBER--The county was originally covered with an immense growth of timber. Along the principal streams in the valleys the white pine predominated. On the rolling land hemlock attended with swalls of beach, maple, birch, cherry, chestnut, oak and hickory was found. It is estimated that from the organization of the county in 1804 up to the year 1865, that one thousand million feet of white pine lumber was cut and marketed at an average price of about seven dollars and fifty cents per thousand, the citizens of Tioga County thus receiving about seven million five hundred thousand dollars for their white pine lumber, up to twenty years ago. What pine was then left was mostly owned by large and strong companies, who have received at the rate of about eighteen or twenty dollars per thousand for the pine they have sold. The market which the early lumbermen of Tioga County sought was the southern, and was reached by the waters of Pine Creek, Cowanesque, Tioga, Chemung and Susquehanna rivers, thus making the rafting and floating of lumber upon the bosom of these waters a great and exciting industry. About twenty years ago the hemlock lumber, or rather the hemlock became an object of considerable attention, on account of the value of its bark for tanning purposes. At first the hemlock was felled and the bark peeled from it and taken to the tanneries, the trunk suffered to remain in many instances in the woods to decay where it laid. By and by architects tested its strength and found that it was a valuable timber for building purposes, and a market for it soon sprung up. But the demand for the bark now exceeds the demand for hemlock lumber. Of this we shall write more fully under the head of tanning. The oak, hickory and chestnut are substantially gone, while here and there remain tracts of beech, maple, yellow birch and black birch, with cherry interspersed. But these lands are chiefly owned by Mining and Tannery Companies, and are not to any great extent in the hands of individuals. The Mining Companies of the county are owners of about seventy-five thousand acres of timbered and coal land; the Tanning companies about forty thousand acres of timbered land, other companies about twenty-five thousand, making a grand total of about one hundred and forty thousand acres in the hands of a very few. The remainder of the timberland consists of small tracts, which are principally owned by those who desire them for their own use, or perhaps to carry on the business of lumbering upon a small scale. PIONEERS--The pioneers in the settlement of Tioga County were generally men of intelligence. They came from all sections of the country, from Southern Pennsylvania, from Maryland, Virginia, Delaware, New Jersey, New York, Vermont, Massachusetts, Rhode Island and Connecticut, determined to make themselves a home in a land, which for centuries before 1784 had been in possession of the six nations of Indians. Their hardships and privations were many, yet inspired by the salubrity of the climate, the grandure of the forest scenery and the productiveness of the soil, the beautiful springs, rivulets, creeks and rivers, the abundance of game, they pursued their labors with untiring zeal and energy, and many of them lived to a ripe old age, and saw ere they slept with their fathers, where once the forest was unbroken, fields of waving grain and pastures green, the cabin torn down, and the comfortable farm house erected in its place, the rough corduroy wagon road, supplanted by the railroad with its iron horse and tireless energy, the post boy on horseback, yielding to the postal car, or telegraph. The names of the pioneers will appear in their respective villages, townships or borough histories. SELECTION OF COUNTY SEAT, ETC.--In the year 1806, Wellsboro was selected as the county seat of Tioga County, and in the year 1818 the first court was held, Hon. J. Bannister Gibson, Circuit Judge, presiding. The court was held in a log house facing the public square. Pursuant to an act of the Legislature of March 14th, 1814, Hopestill Beecher, Timothy Ives and Ambrose Millard on the 6th of October 1814, apportioned the County into six districts for Justices of the Peace. The first district was composed of the township of Delmar, and contained eighty-seven taxables. Daniel Kelley was the Justice of the Peace. The second district was composed of Deerfield, and contained sixty-three taxables. The third district was composed of the township of Elkand, with seventy-nine taxables, with Dorman Bloss, Justice of the Peace. The fourth and fifth district was composed of the township of Tioga (then embracing what is now divided into a dozen or more townships) and William Rose, Justice of the Peace with one hundred and thirty-nine taxables. The sixth district was composed of the township of Covington, from which also a dozen townships have been formed, then containing ninety-five taxables, Daniel Lamb and Elijah Putnam being the Justices. The total number of taxables at that time in the county were four hundred and sixty-three. COUNTY OFFICERS--Representatives--John Ryon, 1822; Fames Ford, 1894; Curtis Parkhurst, 1827; John Beecher, 1829; Samuel W. Morris, 1831. (Tioga and Bradford Counties at that time composed one representative District and in 1835 Doct Bullock and Israel Meyers, both of Bradford County were elected for the district). William Garretson, 1836. In 1888 Tioga and Potter Counties were a representative district, Lewis B. Cole, of the latter named county was chosen. John Wakeley, 1840; Daniel L. Sherwood, 1841; George Knox, 1846; John C. Knox 1845; N. A. Elliott 1847; James Black, 1849-51; J. J. Monroe, 1850; James Lowrey, 1852; Thomas L. Baldwin, 1854; L. T. Williston, 1856; B. B. Strang, 1860; S. B. Elliott, 1861; C. O. Bowman, 1862; John W. Guernsey, 1863; William T. Humphrey, 1865; Jerome B. Niles, 1868; John I. Mitchell, 1871; C. V. Elliott, 1876; Hugh Young, 1876, served one year and resigned, and Benjamin Dorrance elected to fill vacancy; Charles Tubbs, 1880; Jerome B. Niles, 1880. STATE SENATORS--John Ryon, 1824; Daniel L. Sherwood, 1846, elected speaker; John W. Guernsey, 1852-3; Stephen F. Wilson, 1862-3; B. B. Strang, 1871-76; Charles H. Seymour, 1877-78. MEMBERS OF CONGRESS--James Ford, 1828-30; Samuel W. Morris, 1836; Stephen F. Wilson, 1864; Henry Sherwood, 1870; John I. Mitchell, 1876; Congressman at large, Mortimer F. Elliott, 1883. UNITED STATES SENATOR--John I. Mitchell, 1881. UNITED STATES BANK EXAMINER--Hon. Hugh Young, 1876, present occupant. UNITED STATES REVENUE COLLECTOR--Hon. S. B. Elliott, 1863; Massena Bullard, 1865 to 1883; Lucius Truman, 1883, present occupant. HIGH SHERIFFS--Alpheus Cheeney, 1812; Simeon Power, 1815; John Knox, 1818; Elijah Stiles, 1821; John Beecher, 1824; Robert Tubbs, 1827; Seth Daggett, 1830; Frances Weatherby, 1831; Benjamin Gitchell, 1836; John Wakely, 1837; Curtis Parkhurst, 1840; J. W. Guernsey, 1843; Henry M. Potter, 1846; John Mather, 1849 and in 1855; Henry A. Guernsey, 1852; Simeon I. Power, 1858; Hezekiah Stowell, Jr., 1861; Leroy Taber, 1864; Jerome B. Potter, 1867; E. A. Fish, 1870; Stephen Bowen, 1873; Delos H. Walker, 1876; H. J. Landrus, 1879; Harry Baxter, 1882. COUNTY SURVEYORS--John Norris, from 1814 to 1827; Samuel McDougal from 1827 to 1836; E. P Deane from 1836 to 1839; Samuel McDougal from 1839 to 1850; David Heise from 1850 to 1856; Henry Archer from 1856 to 1859; E. P. Deane from 1859 to 1863; D. L. Deane from 1863 to 1865; David Heise from 1865 to 1885. PROTHONOTARIES--John Norris, 1813; Uri Spenceer, 1818; John Patton, 1821; Uri Spencer, 1824; J. Brewster, 1831; John F. Donaldson, 1836-7; A. S. Brewster, 1838; John F. Donaldson from 1839 to 1872; General Robert Cox from 1872 to 1885, present incumbent. COUNTY TREASURERS--Samuel W. Morris, 1811; Alpheus Cheeney, 1814; B. Thompson, 1815; Benjamin W. Morris from 1817 to 1819; Daniel Lamb, 1822; John Beecher, 1823-4; Thomas Putnam, 1825-6; William Willard, 1827-8; Lewis Vail, 1829-30; Elihu Hill, 1838-41; Thomas Dyer, 1834-5; John Barnes, 1836-7; Elihu Hill, 1838-41; Archibald Knox, 1842; R. G. White, 1844; John L. Robinson, 1846; A. H. Bacon, 1848; George Levergood, 1850; S. L. Hibbard, 1852; George Knox, 1854; Henry Rathbone, 1856; O. H. Blanchard, 1858; O. F. Taylor, 1860; J. S. Watrous, 1862; H. B. Card, 1864; A. M. Spencer, 1866; C. F. Miller, 1868; H. C. Bailey, 1870; R. C. Cox, 1878; H. Roland, 1875; Thomas Allen, 1876; Thomas Bryden, 1878; died during term of office; Charles F. Veile, appointed; John R. Bowen, 1881. Horton, 1883, present incumbent. REGISTER AND RECORDER--William Bache, 1821; Uri Spencer, 1824; B. B. Smith, 1831; Luman Wilson, 1836; James P. Madill, 1845; John N. Bache, 1848; James P. Madill, 1851; William D. Bailey, 1854; Henry S. Archer, 1860; D. L. Dean, 1866; George C. Bowen, 1875, present incumbent. COUNTY COMMISSIONERS--Eddie Howland, 1809; Caleb Boyer, Uri Spencer, George Hart, Nathan Niles, 1810; Timothy Ives, 1812; Hopestill Beecher, 1814; Justus Dartt, 1815; Robert B. Elliott, 1816; John Knox, 1817; Asa Mann, 1818; Elijah Depue, 1819; John Ryon Jr., 1820; Oliver Willard 1821; Seth Daggett, 1822; Hiram Beebe, 1823; William Knox, 1824; Elijah Welch, 1825; Elijah Stiles, 1826; James Goodrich, 1827; L. Jackson, 1828; John Cochran, 1829; E. P. Gerould, 1830; Job Geer, 1831; A. Hammond, 1832; C. Olivert, 1833; Geo. Knox, 1834; Samuel Miller, 1835; C. N. Sykes, 1836; P. Doud, 1837; George Levergood, 1838; Buel Baldwin, 1839; Levi Elliott, 1840; C. O. Spencer, 1841; M. W. Stull, 1842; H. M. Potter, 1843; E. Howland, 1844; William Rose Jr., 1845; John Fox, 1846; Israel Merrick, 1847; David Ellis, 1848; Leander Culver, 1849; David Caldwell, 1850; Ansel Purple, 1851; Benjamin VanDuzen, 1852; Austin Lathrop, 1853; O B. Wells, 1854; G. G. Stevens, 1855; C. V. Culver, 1856; John James, 1857; L. B. Seeley, 1858; Amos Bixby, 1859; A. Barker, 1860; Job Rexford, 1861; C. F. Miller in 1862, appointed to fill vacancy, elected in 1863; Myron Rockwell, 1863; E. S. Seeley, 1864; E. Hart, 1865; R. VanNess, 1866; A. Barker, 1867; M. W. Wetherby, 1868; R. VanNess, 1869; A. Barker, 1870; T. O. Hollis, 1871; E. Hart, 1872; L. B. Sheives, 1873; E. Klock, 1874; L. B. Smith, E. J. Purple, 1875; N. A. Elliott, A. O. Smith, 1878; N. A. Elliot, A. O. Smith, 1881; James E. Peters 1878-81; C. M. Rumsey and John J. Reese, 1881; William Kimble, W. H. Baxter and John Karr, 1884. COUNTY SUPERINTENDENTS OF SCHOOLS--The supervision of the common schools by County Superintendents, commenced in the year 1854. Superintendents are chosen by a convention of school directors of the various townships and boroughs of the county. The term of office is three years. They have been Rev. N. L. Reynolds, Rev. J. F. Calkins, H. C. Johns, S. B. Price, Elias Horton, Jr., Miss Sarah I Lewis and M. F. Cass. An election takes place in the month of May 1885. JUDGES OF THE COURT OF COMMON PLEAS, who have resided in Tioga County--Hon. Robert G. White, two terms from 1851 to 1871; Henry W. Williams, additional Law Judge from 1865 to 1871. President Judge from 1871 to 1881, re-elected in 1881, term expires in 1891; Judge Stephen F. Wilson, appointed additional Law Judge in 1871 to fill the vacancy occasioned by the promotion or election of Judge Williams to the office of President Judge--elected additional Law Judge in 1872 and served until the year 1882. MEMBERS OF THE CONSTITUTIONAL CONVENTIONS--Robert G. White, 1837; Mortimer F. Elliott and Jerome B. Niles, 1873. COURT AND BAR OF TIOGA COUNTY--President Judge--Hon. Henry W. Williams. Associate Judges--Hon. Harvey Lamkin, Hon. George H. Baxter. Prothonotary or Clerk of the Court--Gen. Robert C. Cox. Clerk of Orphan’s Court--George C. Bowen. District Attorney--J. H. Matson. ASSOCIATE JUDGES--since the organization of the courts of the county the Associate Judges have been: Samuel Morris and Ira Kilbourn from 1818 to 1830; since that time John Ryon, Curtis Parkhurst, Jonah Brewster, Simeon Power, Levi J. Nichols, Edwin Dyer, J. C. Whittaker, Abel Humphrey, Victor Case, Royal Wheeler, Charles F. Veile, E. T. Bentley, L. B. Smith, D. McNaughton, John F. Donaldson, M. K. Retan, Peter VanNess, George H. Baxter and Harvey Lamkin. Present incumbents, George H. Baxter and Harvey Lamkin. BAR OF TIOGA COUNTY--some of the most distinguished men in the state have been members of the Tioga County bar, and have filled places of distinction and honor, such as Judges of the Supreme Court, Attorney-Generals, Members of Congress and United States Senators, and Auditor Generals. The present members are. Wellsboro--Hon. Henry Sherwood, Walter Sherwood, Mortimer F. Elliott, F. Watrous, Jerome B. Niles, henry M. Foote, George W. Merrick, S. F. Channell, Alfred J. Shattuck, John I. Mitchell, David Cameron, Jeff Harrison, John N. Bache, D. L. Deane, Robert C. Simpson, Thomas Allen, A. L. Ensworth, John W. Mather, J. H. Matson, A. S. Brewster, Hugh Young, Ezra B. Young, L. P. Williston, Horace B. Packer, Stephen F. Wilson, Herbert Huntington, Burt M. Potter, Clark W. Beach. Mansfield--Henry Allen, Frank W. Clark, John W. Adams. Tioga--A. Redfield, F. E. Smith, H. L. Baldwin, Norman H. Ryon. Lawrenceville--Wallace P. Ryon, Horace M. Darling. Elkland--John S. Ryon, Robert T. Wood. ROADS--In 1792, General Williamson, under the immediate supervision of Robert and Benjamin Patterson, caused a road to be constructed from Northumberland via Williamsport, Trout Run, Block House and Blossburg down the Tioga valley to Painted Post, thence up the Conhocton River to Bath. In 1806, the Legislature of the state passed an act, authorizing the building of a road from the Moosic Mountains in Luzern to Towanda, thence via Troy, Covington, Wellsboro to Coudersport. By a supplement to this act, the road was authorized to be continued westward to Smethport and Warren thence to Erie. The road through Tioga County was completed in the year 1809. A road was constructed very early in the history of the county from Newberry in Lycoming County near Williamsport via Englishtown, Babbs Creek to Wellsboro. After the county was completely organized, roads were constructed in various sections, as necessity required, and they were succeeded by the laying out of the township roads. RAILROADS--At the session of the Pennsylvania Legislature held in 1826, a "General Improvement Act" was passed. About this time action was taken by enterprising citizens of Tioga County for the formation of a navigation Company. Prominent among these citizens was Hon. Samuel W. Morris of Wellsboro. A charter was obtained and by successive supplements the navigation company obtained the right to construct a railroad from Blossburg to the state line at Lawrenceville. Another company was formed in the state of New York, with power to construct a railroad from where the flourishing village of Corning now is to Lawrenceville, and intersect or connect with the railroad to be constructed by the citizens of Pennsylvania. These railroads were constructed and completed in the year 1840, and were first known as "The Corning and Blossburg Railroad." The road bed was graded and flat rails of iron spiked upon timbers. The road was in operation about thirteen years, when new companies were formed, and the strap or flat rail taken up, and a T rail put in its place. The Hon. John Magee and his co-adjutors operated and owned that portion of the railroad situated in the state of New York, and a company whose principal stockholders were residents of Philadelphia, Pa., operated and controlled that portion situated in Pennsylvania. The length of the road was in New York fifteen miles, in Pennsylvania twenty-five miles, total forty miles. In 1854 four miles of railroad were constructed from Blossburg to Morris Run, where mines of semi-bituminous coal was opened. Col. Pharon Jarret, of Lock Haven, was the engineer of the latter road, and Col. W. E. Fox, of Towanda, engineer of the road constructed in 1840. In 1866, a railroad four miles in length, reaching from Blossburg to the present village of Arnot was constructed. In 1876, about twenty miles of railroad was constructed from Elmira, N.Y., intersecting the old Blossburg road in the township of Lawrence. All the roads, excepting the one from Lawrenceville to Corning, is now known as "The Tioga and Elmira State Line Railroad," and is operated by the New York, Lake Erie and Western Railroad Company, of New York. In the year 1859, a railroad was constructed by the Fall Brook Coal Company, Hon. John Magee, president, from Blossburg to the present borough of Fall Brook, a distance of about seven miles. In 1872, a railroad was constructed by the Fall Brook Coal Company, from Lawrenceville via Tioga, Hollidays, Middlebury, Niles Valley, Stokesdale, Wellsboro, Round Top, to where the present mining town of Antrim is located. In the year 1872-3, a railroad was also constructed from Lawrenceville, via Nelson up the Cowanesque river to Elkland, a distance of about twelve miles. 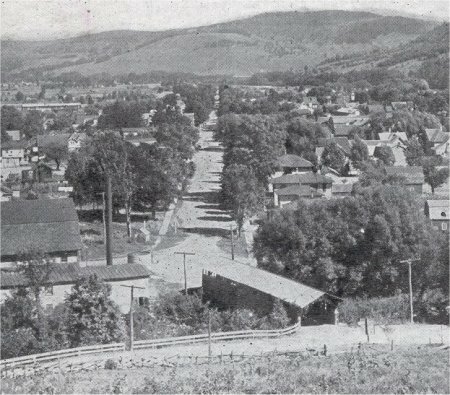 This road, about ten years afterwards, was extended westward up the Cowanesque valley via Academy Corners, Osceola, Knoxville, Cowanesque; Westfield to Harrison Valley in Potter County. In the years 1882-3 a railroad was constructed from Stokesdale down Marsh Creek to Ansonia on Pine Creek, thence down Pine Creek to Jersey shore, thence down the west branch of the Susquehanna to Williamsport, connecting with the Philadelphia and Reading lines. This road is under the management of the Fall Brook Coal Company and is known as the Jersey Shore and Pine Creek railroad. Hon. Henry Sherwood of Wellsboro is the President of this road. In the year 1882 a railroad was built from Arnot to Hoytville, a distance of fourteen miles, known as the Arnot and Pine Creek railroad. It connects at Arnot with the Tioga and Elmira State Line R. R., and is under the same management as that railroad. Also during the year 1882 a narrow gauge railroad was constructed from Addison, Steuben County, New York, into the Cowanesque Valley, Tioga County, Pa., touching Nelson, Elkland, Academy Corners, Osceola, Knoxville, Westfield, thence south up Mill Creek to Sabinsville, and down Long Run to Gaines on Pine Creek, with a branch ascending the mountains to Gurnee, a mining town owned by the Gaines Coal and Coke Company. This line during the year 1884 was extended up Pine Creek to Pike Mills or Galeton, a distance of five miles. The length of the entire line now is about forty-six miles. CORNING, COWANESQUE AND ANTRIM RAILROAD, OFFICERS--George J. Magee, President; Daniel Beach, Vice President, Secretary and Treasurer; Anton Hardt, Chief Engineer; Alonzo H. Gorton, General Superintendent. Directors, George J. Magee, Daniel Beach, Alfred L. Edwards and Henry Sherwood. PINE CREEK RAILWAY, OFFICERS--Henry Sherwood, President; George J. Magee, Vice President; William Howell, Secretary; Cornelius Vanderbilt, Treasurer; Anton Hardt, Chief Engineer. Directors, George J. Magee, William H. Vanderbilt, Cornelius Vanderbilt, Chauncey M. Depew, William Howell, E. G. Schiefflein, Walter Sherwood, Jefferson Harrison, Jerome B. Niles, Anton Hardt, John W. Bailey and Henry Sherwood. TIOGA AND ELMIRA STATE LINE RAILROAD, OFFICERS--John King, President; R. Cable, Superintendent; C. C. Drake, Secretary and General Agent; D. S. Drake, Treasurer. ARNOT AND PINE CREEK RAILROAD, OFFICERS--Levi H. Shattuck, President; David S. Drake, Secretary and Treasurer. ADDISON AND NORTHERN PENNSYLVANIA RAILROAD, OFFICERS-Hon. Thomas C. Platt, President; William Brookfield, Vice-President; William C. Shelden, Treasurer; James E. Jones, Secretary; Frank M. Baker, General Superintendent; H. C. Hitchcock, Auditor; James P. Wright, RoadMaster. MINING OF SEMI-BITUMINOUS COAL--As early as 1792, when Robert and Benjamin Patterson were conducting General Williamson’s party of five hundred German and English emigrants or settlers to the Pultney estate in New York, they discovered coal in the mountains, within the present borough limits of Blossburg. In the year 1806, Aaron Bloss removed from Covington to "Peter’s Camp," a camp made by the Williamson party in 1792, erecting an inn where he entertained travelers who were journeying upon the Williamson road between Painted Post, Williamsport and Northumberland. This inn was situated in the southern portion of the present borough of Blossburg. Mr. Bloss opened up in a rude manner the vein of coal near his dwelling or inn and at about the same time Clemons, who resided about two and a half miles north of Mr. Bloss opened up a vein of coal situated in the northeastern portion of the present borough of Blossburg. From these small and temporary openings has the immense coal trade of the Blossburg semi-bituminous coal been brought about. We have not the space to enter into all the details in relation to the development of the trade, but must content ourselves with a concise and brief statement of the leading facts. The finding of the coal in such quantities, was the main-spring which set in motion the construction of the Blossburg and Corning Railroad in 1837 which was completed in 1840. Its existence also had much to do in influencing the Legislature of New York to pass an act for the digging of the Chemung Canal and Feeder, which was completed in 1833. After the completion of the Blossburg and Corning Railroad in 1840, the Arbon Coal Company opened up the mines upon the Clemmons property at Blossburg, and commenced the shipment of coal. They shipped from 1840 to 1843, 49,633 tons. The mines then passed into the hands of William M. Mallory & Co., who from 1844 to 1856 shipped 405,116 tons; D. S. Magee then became the operator and shipped 78,996 tons, making a total of 533,745 tons taken from the Blossburg mines for shipment by rail. In 1852 mines were opened at Morris Run, an account of which will appear in the history of that place. Mines were opened at Fall Brook in 1859, and shipment commenced. Mines were also opened at Arnot in 1866, and at Antrim in 1869-70 and shipment commenced in 1872. Mines of semi-bituminous coal were opened at Gurnee, in the township of Gaines in the year 1882, and shipment per rail commenced in the year 1883. The total amount of coal mined and shipped to market since the year 1840 from Tioga County up to January 1st, 1885, is about in round numbers sixteen million five hundred thousand tons. GLASS MANUFACTURING--There are two well conducted window glass manufactories, one located in Blossburg and one in Covington. They are now both operated by Hirasch, Ely & Co., upon the co-operative plan. The Blossburg glass manufactory was erected in the year 1847, by William Dezang of Geneva, and the one at Covington several years later. The sand rock suitable for the manufacture of glass exists in inexhaustible quantities in the southern portion of the county. The history of the manufacture of glass in Tioga County will more fully appear in the histories of Blossburg and Covington. TANNERIES--The tanning of sole leather in the County of Tioga has assumed grand proportions within the past few years. To give the reader an idea of the magnitude of its business, we would state that it takes the hemlock bark from one hundred and eighty million feet of hemlock timber to supply the annual demand of the tanneries of the county. The value of the products of the tanneries is counted by the million. AGRICULTURAL SOCIETIES--There are two flourishing agricultural societies in existence in the county--one holding its annual exhibition and fair at Wellsboro and one at Mansfield. These will be more fully described in the history of those boroughs. INSTITUTIONS OF LEARNING--From the early settlement of Tioga County to the present, great interest has been manifested by the citizens of the county in the establishment and maintenance of suitable institutions of learning, whether it was at a time when a few neighbors joined and erected a log school house, or whether it was in the establishment of an academy, graded or normal school, with facilities for imparting knowledge commensurate with the wants of the public. As early as 1817 an academy was established at Wellsboro and some of the most prominent and intelligent men in the county selected as trustees. Pursuant to an act of incorporation of March 25th, 1817, Ambrose Millard, Daniel Lamb, William Bache, John Norris, Nathan Niles, Jr., Asa Mann, Alpheus Cheeney, John Knox, Joseph McCormick, Isaac Baker, Samuel W. Morris, Eddy Howland, Robert Tubbs, Uri Spencer, William D. Bacon, Nathan Rowley, Jr., James Gray and Justus Dartt were appointed trustees and received from the state an endowment of two thousand dollars. The academy erected then remained in use until a few years ago, when it was superseded by the elegant graded school. Tioga County was among the first counties in the state of accept the provisions of the common school act of 1834. SOLDIERS’ ORPHANS’ SCHOOL--The Soldiers’ Orphans’ School was established at Mansfield, October 1st, 1867, under the direction of the State Superintendent of Soldiers’ Orphans’ School, and Prof. F. A. Allen, the late eminent scholar and teacher, appointed principal. The school opened at first with only twenty-five students, but increased in usefulness and numbers until there were about two hundred pupils, sons and daughters of deceased soldiers, and children of indigent soldiers who were not able to give their children suitable educational advantages elsewhere. Prof. Allen was untiring in his efforts for nearly thirteen years in looking after their educational and moral training. The writer of this sketch has frequently visited the institution, while it was under the direction of Prof. Allen, and was pleased beyond expression, witnessing the paternal care exercised by the late professor over these wards of the old Keystone state. The Professor was very fortunate in his selections of assistants, and was ably seconded by Mrs. Allen and his corps of teachers. After the death of professor Allen, which occurred February 11th, 1880, his widow became the head of the institution which position she still occupies. Prof. Vine R. Pratt, for nearly fifteen years was one of the principal teachers and managers in the institution. In the year 1872, a farm consisting of about one hundred and fifty acres, located upon the west side of the Tioga river, about half a mile from the school, was purchased, and where the boys are given lessons in practical farming. Prof. Allen was practical in his teaching, and aimed to give these orphans an education, which would enable them to gain a livelihood after they should pass from under his care. Hundreds will point to him as their best friend. STATE NORMAL SCHOOL--On the 11th of December, 1862, the State Normal School for the fifth district of Pennsylvania was established. The building for several years previous had been used as a seminary of learning under the auspices of the M. E. Church. Its history as a seminary is eventful and marked by a heroic struggle of its founders. When the aid of the state was called in, its friends disappointed in some degree, nevertheless joined heartily in making it a success as a State Normal School. It was financially embarrassed and the sheriff was at its door. By an united effort on the part of its friends, appropriations were secured, which placed it temporarily out of danger and finally after years of financial difficulties it was placed upon a solid foundation; new and additional buildings were erected commensurate with its requirements. To enumerate all its friends would be to write the names of every citizen in the borough of Mansfield, township of Richmond and surrounding country. There are however, names which deserve especial mention and which it would be rank injustice not to write out. We therefore name, J. S. Hoard, Dr. J. P. Morris, P. M. Clark, W. C. Ripley, A. Bixby, R. B. Buttler, John Voorhes, B. M. Bailey, A. J. Ross, Phillip Williams, Hon. Simon B. Elliott, Rev. W. Cochran, and Samuel Baker.